Cable & Wireless HQ case study. Cable & Wireless is one of the world’s largest telecommunications enterprises with associated companies in 50 countries, including Mercury in the UK. The versatility and scope of the Blanc de Bierges system of handcrafted building and landscaping components – as well as the company’s ability to collaborate with designers – were fully tested in this Cable & Wireless project. Richard Wilcock looks at the important role of Blanc de Bierges in the realisation of the design by architects MJP Architects. The training facility for Cable & Wireless in Coventry has been recognised as one of the finest buildings completed in the UK in recent years: “It is one of the best new buildings in Europe,” according to Jonathan Glancey, architectural correspondent for The Independent. Having won the accolade of the Royal Fine Art Commission/Sunday Times Building of the Year Award for 1994, the Cable & Wireless College has achieved a string of other awards and commendations. Take a virtual tour of the site. The brief for the building given to architects MJP Architects was to provide a ‘centre of excellence in training and research’. The architects had extensive experience in designing educational facilities. Partner David Prichard realised that this brief for a complete college was ‘quite exceptional’ and that the client wanted a very special solution. The prestigious nature of the project is reflected in the quality of the design and the materials used. The natural creamy buff colour and handcrafted appearance of Blanc de Bierges is an integral part of the visual appeal of the project. It blends beautifully with other materials, such as the Kirkstone slate, needle-gunned in-situ concrete, copper cladding and the distinctive green-blue glazed roof tiles used on the wave-like, north-light roofs of the two teaching wings. In total there were 76,000 elements of Blanc de Bierges used in the project, based on 139 different types of components: 11 standard, 85 specially created and 43 modifications of standard components. Sited on the edge of a technology park close to Warwick University, the Cable & Wireless College looks out over open countryside. It caters for around 300 students, more than half living on site. The teaching areas are laid out in a series of strips across the site running from east to west. 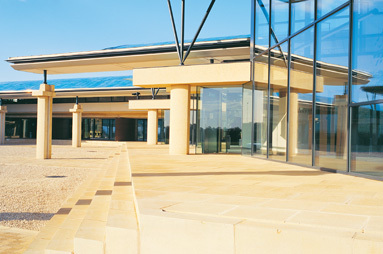 The main entrance is to the south where the wings of the teaching blocks open out and embrace the countryside beyond, like a Palladian villa – one of the inspirations for the design. Blanc de Bierges is first seen at the entrance where ‘L’ Modules have been used on the wall, which reduces the impact of the main road on the College’s view of the countryside. 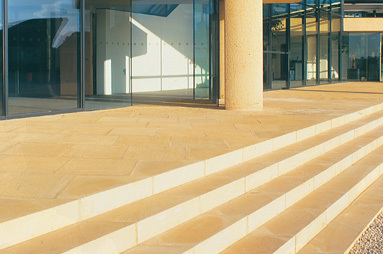 The powerful diagonal route, paved with Blanc de Bierges 600 x 600 mm slabs and 140 x 140 x 40 mm setts, leads along the edge of the west teaching block, under the library and through the central oculus to the reception area. Flights of stairs, constructed with steps cast at an angle to orientate with the paving, lead up to the walkways around the plinth and down into the lake. Central facilities – such as the refectory, common rooms, library and museum – are placed around the ocular court. Here, four copper-clad columns support a high-level canopy with an oval cut-out. The shape is reflected in the paving where the Blanc de Bierges slabs harmonise with an oval inset of Kirkstone slate. Because of its lively appearance, its ability to perform both internally and externally, and its modularity, Blanc de Bierges has been used as a unifying material throughout the scheme on vertical planes as well as horizontal. 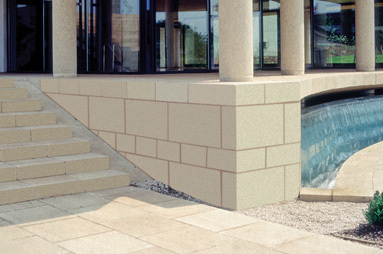 Blanc de Bierges paving slabs (600 x 600 mm and 300 x 600 mm) are used to define the covered cloister on the south facade of the residential block. This links the student bed-sitting rooms, grouped around staircases in the traditional Oxbridge manner, with the communal facilities. The College, as a consequence of its location, is quite self-contained, hence David Prichard emphasises the importance of the refectory as the social hub of this community. At the east end of the site, where the ground rises to form a small hillock, is the leisure pavilion containing the swimming pool, fitness centre, sports hall and bar. 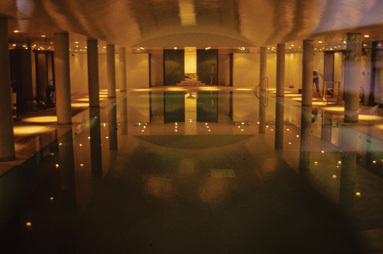 The pool and plant room are buried into the ground, which is then reformed around the building. The bar is at first-floor level and its terrace forms the roof of the pool. The terrace can be reached externally and internally, via Blanc de Bierges steps in a variety of shapes, sizes and edge profiles. A distinctive feature crafted out of Blanc de Bierges components is the fountain in the leisure pavilion. Here, the architects have created the impression that the fountain is the source of water for the swimming pool and that it then flows outside the building over a waterfall, before passing along a narrow rill or water-filled channel framed with Blanc de Bierges 400 x 600 x 200mm steps. The other main water feature is the lake at the main entrance to the college. Here, Blanc de Bierges ‘L’ Modules rise out of the water to form the plinth to the west teaching block. The non-slip finish and low porosity of Blanc de Bierges paving slabs were particularly useful for the wide surrounds to the external water features, the internal swimming pool and for the stairs, reception area and restaurant areas. As it has on other special projects – such as Evans and Shalev’s Tate gallery at St. Ives – Blanc de Bierges rose to the occasion. It was able to do this because it has a dedicated team, steeped in a philosophy similar to that of architects. Some 76,000 elements from a complex 16-week manufacturing schedule were produced exactly on time, and delivered in 52 mixed loads to coincide with the contractors’ phased programme. To achieve this, staff in the Blanc de Bierges factory worked throughout the Christmas/New Year holiday period. Blanc de Bierges is proud to have been involved in this challenging project, showing how close collaboration between designers and manufacturers helps to produce outstanding buildings.